Pope Francis has made a point of visiting prisons or detention centres in almost all of his foreign trips. 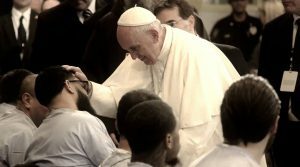 In the weeks leading up to closing his Jubilee Holy Year of Mercy the way he opened it, Francis will devote special events to jubilee celebrations with prisoners and the homeless. On Sunday 6 November he will celebrate a Mass for prisoners and a week later with the homeless. Francis will close the Jubilee of Mercy with a Mass in St Peter’s Basilica on Sunday 20 November, the Feast of Christ the King. Pope Francis has declared there is to be a Jubilee for Prisoners on Sunday 6 November. To honour this special Jubilee day and to encourage ongoing prayer for those in prison, an ‘Adopt a Cell Card’ will be distributed at the Masses in our dioceses on Sunday 6 November. The cards invite recipients to pray for particular individuals who are in prison. A similar prayer card was produced in 2008 with a great response from parishioners and many prisoners were moved to think they were being prayed for. Parishioners are encouraged to pray for all those in prison, their families, the victims of their crime, and those who minister or work with prisoners. A prayer card will also be distributed to prisoners through the Prison Chaplaincy Service. I pray your love and mercy on the past and present occupants. Breathe new life into their hearts. Let hope arises within them. May they find warmth and hospitality when they return to live among us. To be in the presence of the breadth of God is life-giving to all. From the New Zealand Catholic Bishops Conference, Prison Ministry for the Year of Mercy 2016. A Corporal Work of Mercy: but how do we carry it out? ‘Celebrating the Jubilee of Mercy with you is recalling the pressing journey we must undertake to break the cycle of violence and crime. We have already lost many decades thinking and believing everything will be resolved by isolating, separating, incarcerating, and ridding ourselves of problems, believing these policies really solve problems. We have forgotten to focus on what must truly be our concern: people’s lives; their lives, those of their families, and those who have suffered because of this cycle of violence. Pope Francis reminds us how Jesus welcomed everyone into his presence and challenges us to reflect every person is made in the image and likeness of God. We all have the propensity for good and evil and each and every one of us has the propensity for forgiveness. New Zealand has more people in prison than ever before placing immense strain on the facilities and the personnel involved. It is difficult to understand why we have the second highest imprisonment rate in the Western world, after the USA, with 202 people/100,000 population compared to Australia with 152/100,000, Ireland 82/100,000 and Germany 78/100,000. What we do know is internationally those in prison are most likely to be from minority groups, have poor educational achievement, mental-health problems, socio-economic disadvantage and limited opportunities. This aligns with Pope Francis’ call for a system of social health. Our prisons are filled with people who have often had a lifetime of deprivation and abuse. They have no experience of a loving God, of belonging or acceptance in a loving and welcoming community. They lack hope and have little or no knowledge of their rightful place in society or of who they are when they are not committing crimes. Our responsibility as members of the Body of Christ is to create a place for them at the table. We can do that in many ways: praying for them, their families and their victims; writing letters; and advocating for a violence-free society where everybody belongs and is welcomed. We can also support our chaplains in their ministry through prayer and through volunteering in the prisons. Because of the mystery surrounding what happens in prisons and because of the prevailing media portrayal of those who are in there we tend to shy of any involvement and allow our fears to overrule us. This is our own imprisonment – but see what one volunteer says. ‘When I retired from Orthopaedic Surgery at the age of 67, there was on the one hand a sense of freedom from the need to work, but on the other hand a deep sense of loss. I was no longer needed. From being part of a large hospital community I now moved into a much smaller circle of mostly friends and family. In the first year I joined one or two groups, continued in the local Church, mowed the lawn more often and sorted the garden. There were grandchildren to pick up from school, I kept bees and sometimes got in the way of my wife in the kitchen. ‘Then out of the blue I received a call from a prison chaplain whom I knew in her previous life as a senior hospital nurse. “Would I be interested in becoming a ‘prison volunteer’ working under the direction of the chaplains?” I needed time to think about that. I had treated prisoners in hospital; sometimes they were handcuffed to an officer or had a guard at the door. They were fellow human beings who needed help, sometimes an operation. I had never actually been into a prison. Somehow the timing was right. Yes, I would pick up the challenge. ‘This was followed by training to facilitate a grief programme – “Seasons for Growth” designed to be followed by a small group of up to eight participants. There was an introduction to prison rules, procedures and expectations for conduct. Photographs were taken and police checks made. When these were complete an APPE (Authorised Prisoner Provider Entry) identity card with first name, photograph and bar-code was issued and had to be presented at the guard-house for admission and worn at all times in the prison. ‘Initially I visited specific prisoners in the units at the request of the chaplains, usually once a week. I sat in and observed “Seasons for Growth” sessions led by two facilitators. After that I became a facilitator (companion) alongside an experienced companion. Prisoners apply to take the course. There are four, two-hour sessions over a month. It is very popular with positive feedback from prisoners and staff. One of the hardest days of a prison sentence may be the day it ends. Often they re-enter an unwelcoming society with no support other than from those who helped them to get into prison, difficulty finding somewhere to live and unable to find work. Without these economic and relational advantages they may well return to prison where they perceive they have those advantages. There are many opportunities for assisting in this ministry. Contact your local prison chaplain or Sr Veronica, Senior Catholic Prison Chaplain, at vcasey@nzcbc.org.nz for more information. ‘The degree of civilisation in a society can be judged by entering its prisons.’ Dostoevsky’s sentiment remains as true today as it did during his. We might extend his insight by saying civil society can be judged by how many it sends to prison. On this measure, New Zealand would not fare very well at all, as we have one of the highest rates of incarceration in the OECD. With the prison population fast approaching 10,000, Jesus’ words take on new significance: ‘I was in prison and you visited me…for just as you did this for the least of my family, you did it to me’ (Mt. 25:36-40). Such visiting requires both being in solidarity with those behind bars as well as exploring approaches other than punishment for dealing with the harm caused by crime. This is where restorative justice comes in. It offers a way of conceptualising the justice needs that exists in those affected by wrongdoing as well as offering a set of skills for satisfying those needs. As a way of doing justice, it makes space for mercy and compassion to guide all respective relationships towards a more peaceable outcome. Crucial is respect for each person’s human dignity and what needs to be done to restore it. In the context of crime, restorative justice is concerned with restoring a sense of trustworthiness in offenders as they take responsibility for their actions. Restoring wellbeing in victims as their needs are addressed and dignity repaired. Restoring relationships damaged by the offending, especially within whānau. Restoring belonging by extending to the released prisoner all the benefits and obligations of equal citizenship. And finally, restoring peace to society by addressing the drivers of crime. The church could have a special role in realising this high calling. By supporting initiatives that bring together those harmed by crime with those who have done the harm, for the purpose of seeking healing, the church participates in Jesus’ ministry of healing and reconciliation. By welcoming released prisoners into its community and extending its resources, including the community’s source of love and belonging, the church fulfils its mandate of being the beloved community. This work of seeking restoration in wider society is not additional to but, an extension of the church’s own sacramental life. The social actions performed in the Eucharist are meant to overflow the altar so others may begin to taste and see the reconciliation God has ordained for all creation. The community of faith are called to be a foretaste of God’s peaceable revolution, witnessing in its life together His justice and mercy. It is this understanding of justice that the church needs to bring to bear on the pursuit of justice in civil society, especially on how prisoners and their victims are treated. Doing so will not always be easy; indeed, more will be demanded of us. We owe as much to those who are in need of mercy, and we will be a better society for it. Dr Thomas Noakes-Duncan is a lecturer with the Diana Unwin Chair in Restorative Justice – School of Government, at Victoria University of Wellington. Visit the imprisoned – how easy is that? Have we even taken the thought seriously? After all, it is one of the seven Corporal Works of Mercy. Jesus sees a visit to a prisoner as a visit to him – ‘I was in prison and you visited me’ (Mt 25:36). For most people, prisons can be scary places. What we see on TV and in the movies is close to the reality here in New Zealand – razor wire, locked gates, fenced-off walkways, officers with radios, cells around stark gathering places, no grass, that sort of thing. ‘The poor continue to be over-represented in prison populations. The profile of New Zealand inmates is male and mid-twenties. Three quarters of them are single, divorced or separated, two-thirds are beneficiaries and three-quarters are unemployed. Half the population has severe alcohol and or drug problems and many have had a psychiatric assessment. Half of them are from dysfunctional homes. A fifth of them are functionally illiterate and only a tenth have formal educational qualifications. Some people in prison do need to be kept away from mainstream society as they are a threat to the safety of others. But there are other ways to deal with offenders that our justice system needs to consider. In this Year of Mercy, wouldn’t it be a valuable outcome if people made an effort to investigate the possibility of visiting a prisoner – then giving it a go? Ethnicity, gender or age are not really barriers. The important thing is someone takes the time and makes the effort to be part of a prisoner’s life. It just calls for courage to take that first step and find out how it can be done. If it were Jesus in person, would you go to visit him? There lies your answer…. It is not only formal state institutions that hold people prisoner; blindness, deafness, and any disability that limits a person’s ability to enjoy a full life can become a prison. Help to relieve this sense of confinement or isolation and you will be making a beautiful and worthwhile visit. A significant challenge for us all is the over-representation of Māori who make up for more than 50 per cent of the prison population, Māori women 60 per cent, while they comprise some 15 per cent of the country’s population. In a former life I was contracted by Forensics to visit prisons to create cultural plans designed to assist prisoners reconnect to their whānau, hapū and iwi and implement Māori arts and culture activities to enhance their sense of being Māori. Visiting prisoners was privileged work. These men and women I encountered had no façade, they were truly honest and taught me a lot about integrity. You could not but ask the question ‘how is it that so many Māori are incarcerated’? Is it because of historical factors such as colonisation, loss of land, urbanisation, disconnection to our way of life, the mārae, language and culture, that we are the impoverished. Whatever the answer, we are called through the Gospel to visit those imprisoned, for you and I know we are all brothers and sisters, in Christ’s family. Ko tētehi wero nui ki a tātou katoa ko te rahi, he 50 ōrau, o ngā mauhere Māori kei roto i ngā whareherehere, mō ngā mea wāhine, he 60 ōrau, ahakoa he 15 ōrau noa iho a ngāi Māori o te taupori ki Aotearoa nei. I ngā rā o mua he kaimahi ahau mā tētehi peka o te Tāhū o te Ture, ā ko tāku mahi hei akiaki i ngā mauhere kia hono atu ki ō ratou whānau, ki ō rātou hapū, ki ō rātou iwi, ā, ko te whāngai atu i ngā kaupapa Māori kia mōhio mai rātou he mana Māori to rātou. He mahi rangatira te mahi toro atu ki ngā mauhere. He hunga kanohirua kore, he hunga tōtika, nā rātou ahau i ako ki tēnei mea ko te mana o te tangata. Hēoi, ka taka mai te pātai ‘he aha te take he tokomaha ngā mea Māori kua mauheretia? Nā ngā take o mua pea, pērā i te whakawaimeha, i te murunga whenua, i te hekenga ki ngā tāone nui, i te ngarotanga atu o te reo me ā mātou tikanga, ā mātou ritenga hoki, i pōhara ai mātou. Ahakoa te aha, nā te Rongo Pai tāua i karanga kia toro atu ki te hunga kua mauhere me te mōhio, ae, he tuākana, he tuāhine tātou, te whānau a te Karaiti. As we enter Mass we sign ourselves with the waters of Baptism to affirm our place in the Body of Christ and on leaving we sign to commit ourselves to taking Christ to the world. The Offertory symbolises the giving of our week ‒ all we did and said or missed, all our hopes, dreams and prayers. These will be blessed, consecrated, transformed into the Body, the Blood of Christ, by Christ who transforms our offering into a perfect gift to God. Here I am assured of God answering my prayers. It is a great relief to know when I walk through the gates of Whanganui or Manawatu Prisons, I don’t have to be perfect, just present, faithfully sharing pain, joy and hope ‒ their journey. Prison is a time of loss, fear and suffering but can be a time of grace, a renewal of hope and transformation we all yearn for. St Frances de Sales affirmed everyone is drawn to goodness, to God. In prison, I see hunger for the Word, a desire to be who they want to be and want me to believe they are, not as labelled by society, whānau, or themselves. I see those who come to chapel come for different reasons ‒ relief from cells and units, to come closer to something mystical beyond their experience, a desire to be in a place of hope, a passion to worship their God ‒ reflecting the same truth, honest in their brokenness, much the same as in our own congregations. EP Hahnenburg writes, ‘The call to be for others is always a call to be with others, particularly with those who suffer… For it is in the sad but sacred darkness of solidarity with the poor that our senses are heightened, and we come to hear more clearly the voice of God.’ Presence, identification, compassion – this is our call and the call of volunteers who faithfully gather with prisoners to affirm our unity, reflecting their relationship with God and neighbour. JustSpeak is an organisation of young people speaking out for evidenced-informed change in our criminal justice system. Formed in Wellington in 2011 as a youth branch of Rethinking Crime and Punishment, the group is working for innovative change for a more just Aotearoa New Zealand, by minimising imprisonment, enabling better rehabilitation for offenders, and focusing on social problems that lead to offending. JustSpeak director, Dr Katie Bruce, explains. In this Year of Mercy will you help quench our country’s thirst for punishment? In the same month the Government refused to set a target to reduce child poverty, they announced a billion dollars to build cells to house some of these children as adults. The announcement to create another 1800 beds and spend an extra $2.5 billion over the next five years is devastating news to us. JustSpeak believes the proposed new prison is a symbol of the Government’s failure to engage with issues that drive harm in our communities – poverty, homelessness, inter-generational trauma. Over 50 per cent of our prison population is Māori when they make up only 15 per cent of the population. The role of institutional racism is perpetuating and growing this disparity. As a society we choose how we respond to harm. In the last five years we have therefore ‘chosen’ to almost double prison numbers while crime rates fell through changes to our legislation and policy. This Year of Mercy is an opportunity to reflect not on the sins of others, but on our own response to them. Everyone can make a difference. We have to ask ourselves – ‘does our justice system give opportunities for people to move on from their actions and the harm they have caused or been victim to?’ That answer is ‘no’. Over 90 percent of women in prison have experienced family or domestic violence. Over 90 per cent of under-20-year-olds who go to prison are reconvicted within two years of their release. These figures tell us we need to rethink the way we deal with harm in our communities. So what can each of us do in the Year of Mercy and beyond? Support individuals who are inside our justice system through friendship and advocacy and walk alongside them as they deal with a broken system and the stigma created by being inside of it. At JustSpeak we are pushing for investment at the right end so we stop young people from going to prison in the first place. You can sign our petition to raise the age of youth justice to 21 if you go to www.actionstation.org.nz and search for ‘raise the age of youth justice’. You can donate or use your skills to grow our voice so we are better able to speak out for visionary change. Contact me directly at katie.bruce@justspeak.org.nz or visit our website at www.justspeak.org.nz for more information. Challenge 2000 join forces with 32 other organisations committed to social justice and youth care, to urge the Government to include 17-year-olds in the youth justice system, in an open letter penned by JustSpeak. The UN defines a child as a person below the age of 18, in the Convention on the Rights of the Child. New Zealand is a party to this convention, and boasts of one of the most effective youth justice systems in the world, yet – inexplicably – we are still excluding 17-year-old children from this system. We do so in breach of this convention and in breach of our commitment to the care and protection of children. Youth crime and its causes and effects are complex. What is more straightforward is the correlation between incarceration and reoffending. The youth justice system attempts to address youth crime in a more responsive and constructive way, by identifying underlying issues and creating opportunities to resolve these issues. Evidence shows this to be more effective. We need to include 17-year-old children in this system, for our sake as well as theirs. Please join us to discuss this important issue at St Joseph’s Church, Mt Victoria, 6.30pm till 7.30pm, Thursday 17 November. 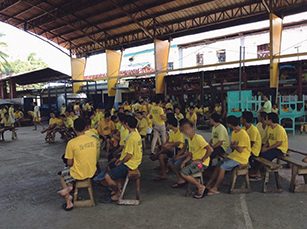 I’ve recently returned from the Philippines where, among other things, I had the privilege of visiting people in a local jail. These people are incredibly faithful to God. It’s a place many people will never see and couldn’t possibly imagine and it’s a disturbing reality. The jail was built for about 600 people but holds around 3000. There are no beds and people sleep virtually on top of each other on a concrete floor. They each have only one set of clothes. It’s dirty, it smells, and it’s rife with skin disease. These people are condemned to this place, unfit for animals, while they wait up to 10 years for a hearing. Many assert their innocence that they haven’t yet had a chance to prove. I believe in their innocence and in the human dignity of each of them. Incredibly they believe deeply in their own dignity and humanity, despite an environment that utterly denies it. Celebrating communion in such a way, with such vulnerable, faith-filled people, was a transforming experience. When Mark came up to me in the jail, and told me he prays everyday for justice and for mercy, I felt I could help communicate God’s answer to these prayers, and I felt – I feel called to do so. Choice: A documentary about meditation changing lives. A new documentary film about people around the world finding peace through meditation will screen in selected New Zealand from 30 October. Choice focuses on how meditation has changed the life of individuals and communities, with the evolution inside Apodaca prison one of the central pillars. Once one of the most violent prisons in Mexico ‒ a jail where 44 inmates died in a battle between rival drug cartels – a change has occurred through a practice known as Ascension meditation. The change is captured in the film made by producer Greg Hopkinson and film-maker Sally Lewis, a New Zealand couple who traded life in the fast lane to become Ishaya monks, teaching Ascension meditation in New Zealand. Today, a quarter of the 2000 prisoners, guards and management in the overcrowded prison regularly practise meditation and it has transformed life in the prison. Suicides are down 40 per cent; there have been no reports of violence since 2012; solitary confinements are down 50 per cent. As well as featuring prisoners, the film also tells the stories of other groups and individuals around the world finding peace – from foster kids to stressed businesspeople to cancer patients and professional ballet dancers. ‘We want to inspire and give hope that there is a different way of being,’ say Sally Lewis.